On October 24th 2013 members of the Lotus team visited the Lotus girls at the Secondary school at kms 35 in Champhone district to deliver a wonderful supply of books generously donated by a local company called Big Brother Mouse. 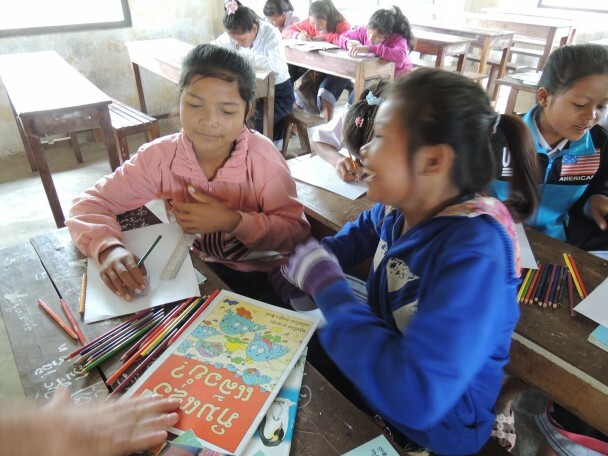 The company is based in the province of Luang Prabang and through the collaborative efforts of our in-country partner Campbell Vearing we were able to provide and deliver literature to the 84 Lotus girls who now attend school in Grade one and six. The books cover a range of authentic traditional Lao fairy tales. These stories help new readers develop their reading skills. As Sasha Alysa from BBM says “Then they get enthusiastic about other books too, because a top priority for us is to publish books that people are eager to read.” Included in the selection were a nature series, with books about life in the sea, insects, and (of course) dinosaurs. As a bilingual resource they will support the wonderful instruction in English that both Campbell and the local English teacher have been providing for the girls. There was much excitement as the girls enjoyed many hours of enjoyment reading through the stories. Lotus is very grateful to both Sasha at Big Brother Mouse and Campbell for their donation to this wonderful project. The Lotus girls enjoyed reading the new books generously donated by local company Big Brother Mouse.